The first twin AMDA baby girls were born on December 28th, 2017 since AMDA Peace Clinic (APC)* started to offer the medical service and advice for the pregnant and postpartum women in 2014. When the mother visited our clinic for the first time in June, 2017 after being introduced by her neighbor, she was feeling nauseas, dizziness and weakness in addition to fever. 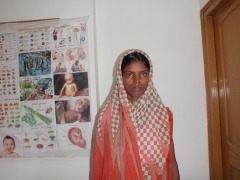 Not only this time, but also she felt weak and sick at times due to malnourishment during her course of pregnancy. APC local nurse continued to visit her house for monitoring and gave her advice accordingly in addition to providing medicine prescribed by APC local doctor. *AMDA Peace Clinic (APC) started its medical service to pregnant and postpartum women since 2014 after shifting it from Ayurveda treatment center. 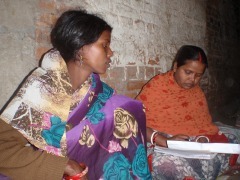 Many women in the area are illiterate and their knowledge in hygiene, the importance of regular prenatal checkup, precautions during pregnancy and others are limited, which puts them in a vulnerable situation. Through our services including home visits, health education, nutrition programme, bimonthly prenatal checkup, provision of prescribed medicines and blood test if needed with minimal fee of 20 Indian Rupees, APC is besides pregnant women to support them during pregnancy and postpartum period.